An eclectic mix of furnishings lend to the study of gordon’s works, on display in his living room. Artist Patrick Gordon has easily settled back into Tulsa life after almost a decade in New York City, where his career flourished. Gordon had his first show in a New York City gallery by the time he was 21. He created two Mayfest posters, including one for the 25th anniversary, had shows in major galleries and museums across the country and was regularly commissioned to paint portraits and custom pieces. However, after years of living in a 1,500-square-foot loft, and as he edged closer to a milestone birthday, Gordon was beginning to feel the tug of returning to Tulsa. Elements, such as a wicker table from his childhood and dining chairs he customized, are both unique and personal for Gordon. The master bedroom is the only room where Gordon displays work by other artists. 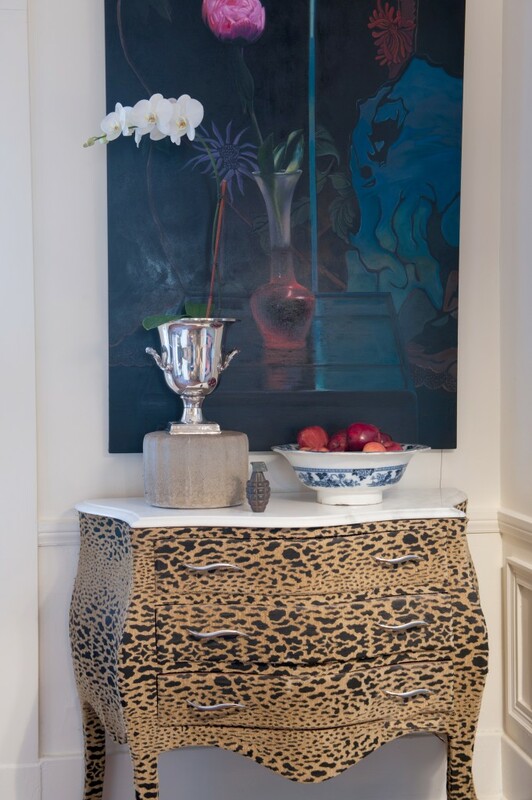 A french bombe commode covered in jaguar-pattern cut velvet graces the living room. 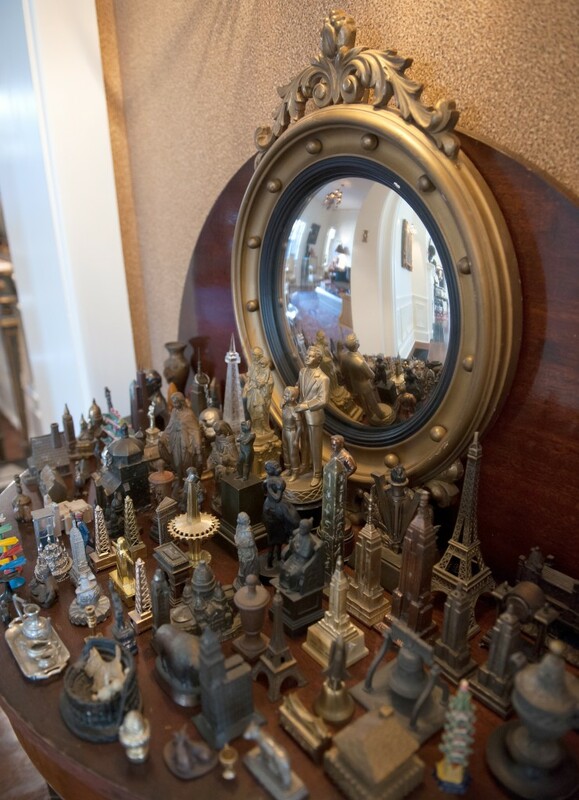 One of the collections the artist has amassed through his work and interests. 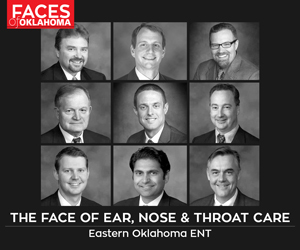 “I made wonderful friends in New York, and I miss them, but there is something about those 40-year-old friendships [in Tulsa] that I couldn’t duplicate there,” he adds. A few months earlier, he’d received a brochure about a home for sale on 21st Street from a friend in real estate. He still wasn’t ready to make the change, but that house “stuck in my head,” he says. The home lingered on the market for months, and when Gordon finally decided to relocate, he bought it. The home, built in 1940, sits across from the Skelly Mansion – “What a view I have!” he exclaims – and itself has an interesting history. After World War II, it was converted into two apartments. And it was the first of many Tulsa houses owned by the late Charles Faudree. 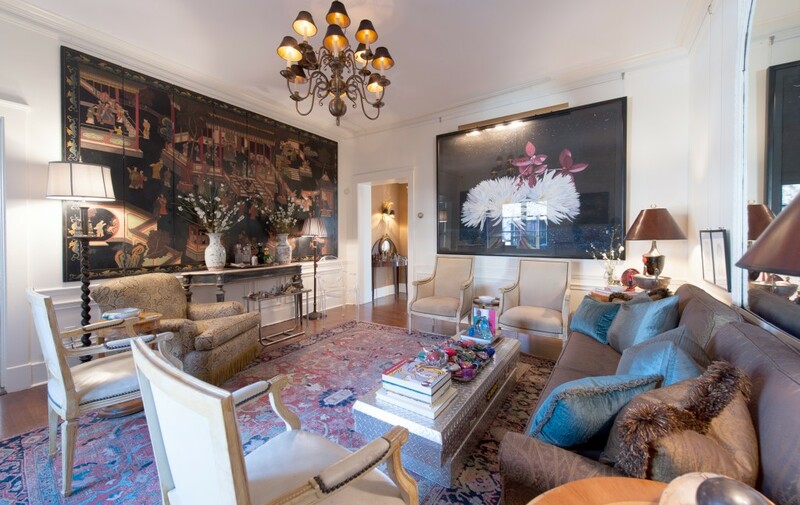 The renowned interior designer lived downstairs, and his sister, Francie, resided upstairs. While the house has changed owners, most of Faudree’s original design remained. “The living room was dark, and the gold leaf ceiling had turned black,” says Gordon. But the house and wood floors were in good shape, so the biggest transition was painting most of the rooms white. 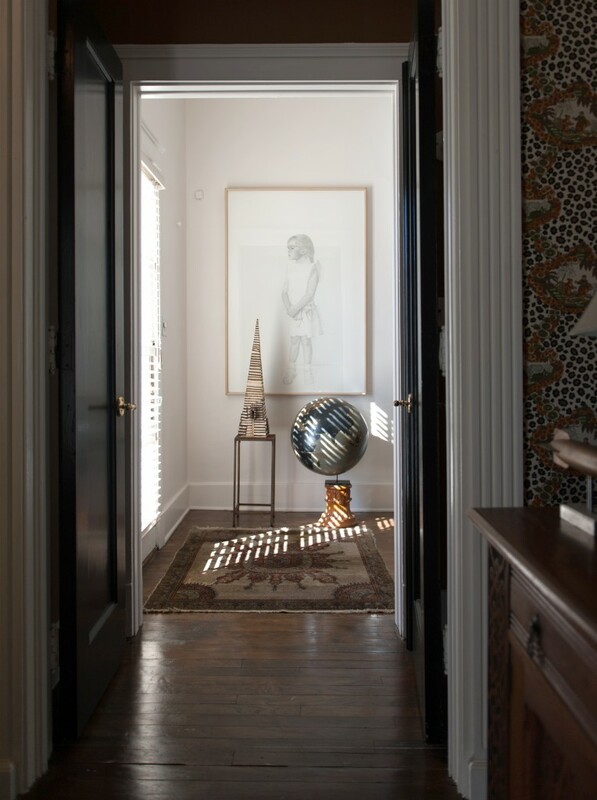 Gordon also removed the wall that split the house into two units; but as homage to Faudree, the original wallpaper and light fixture remain in the entry. 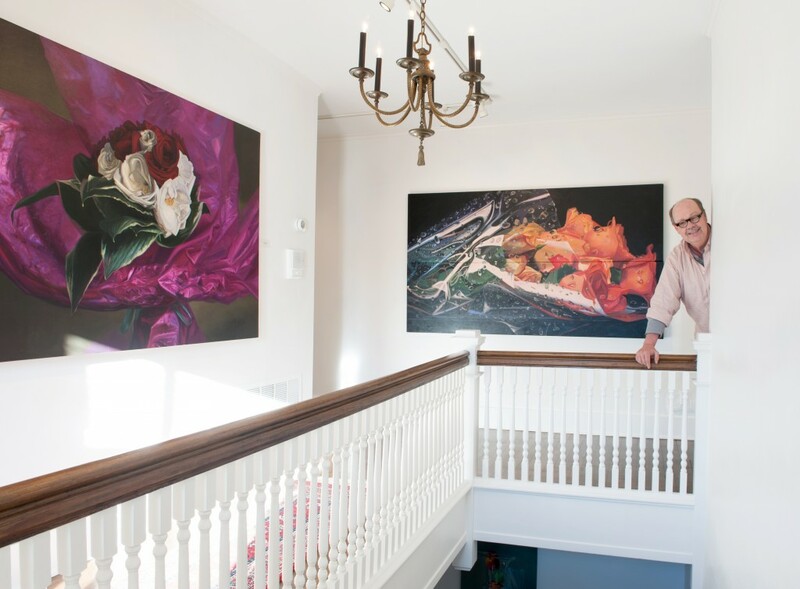 Gordon with two works displaying the vivid detail for which he is renowned. “I’ll never change that,” says Gordon. Because the house was to be Gordon’s working studio, he repurposed most of the rooms. The large living room serves as a studio where Gordon paints often 10 to 12 hours a day. The one exception is Friday, when Gordon and a friend spend a few hours perusing the area garage and estate sales, where he often finds unique items to add to his multiple theme collections. The original library is now the dining room, where Gordon uses the wicker table from his childhood, painted gold, mixed with a set of Louis XVI chairs. “I picked these up at a sale,” he says. Originally mahogany with yellow leather, he first painted the chairs white, then started experimenting with layers of color. When he liked the look, he added the nail head trim. 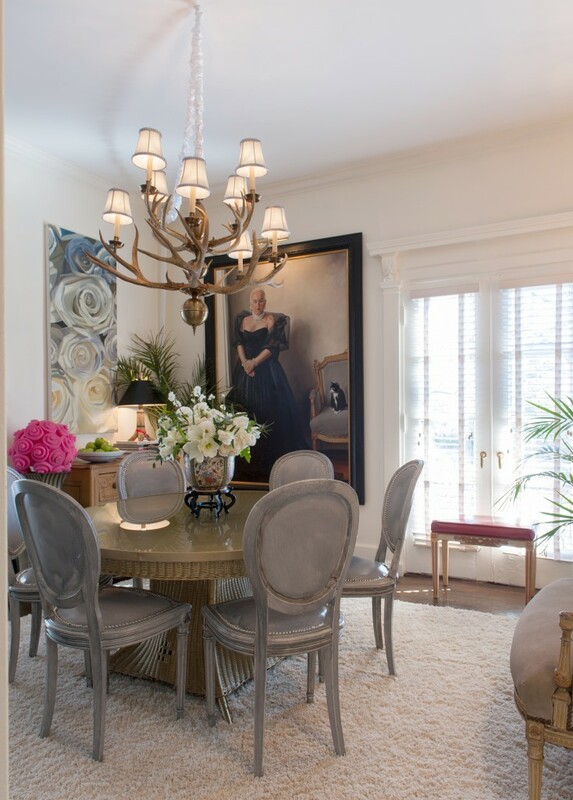 The chandelier over the table is one he’s had for more than 30 years, making the move to New York City and back. The library shelves hold items he’s used in past paintings. 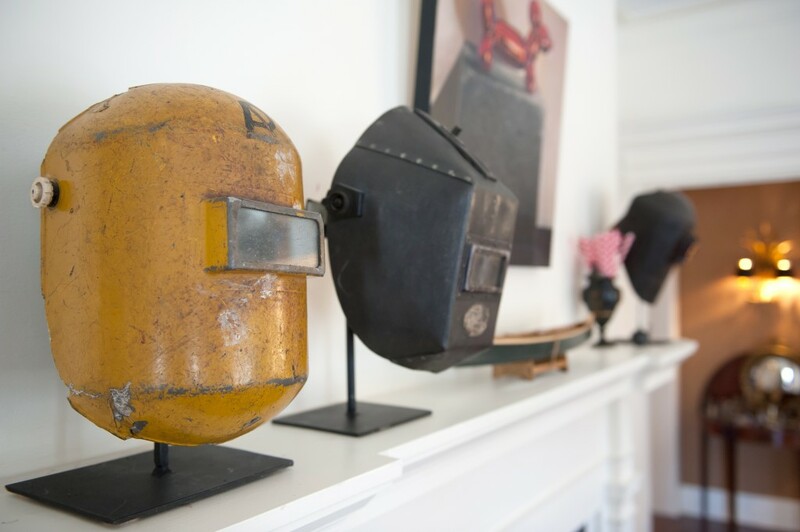 Functional welding masks make bold statements as art. Gordon’s eclectic style is especially evident in the living room, originally an oversized dining room. There’s an acrylic chair at one end and a pair of French bombe commodes covered in a jaguar-pattern cut velvet at the other. Formal chairs flank a stainless steel cocktail table. Upon closer inspection, the “table” is a storage unit for a pick-up truck. “In New York, every inch of space counts, and that was also my silver chest,” he says. On top is his collection of hearts. Gordon’s artwork is on display throughout the house. In his studio, portraits of his daughter made over the years adorn the walls. In the living room hangs his only still-life watercolor displayed in the home, the medium that launched his career. Using a centerpiece from a friend’s apartment in NYC, the painting is done on two pieces of watercolor paper to create the size. Only in his bedroom does he have other artists’ paintings. 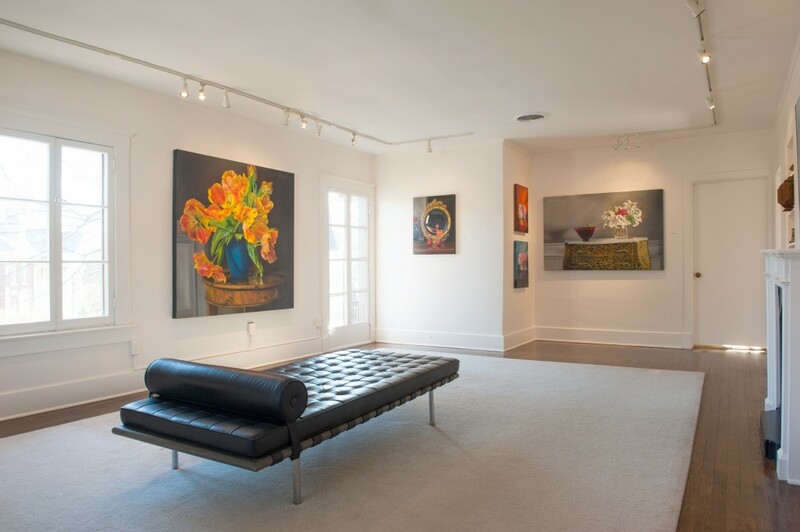 Gordon’s home also serves as his studio and a by-appointment-only gallery for his work. The kitchen update consisted of adding a mirrored backsplash and installing a new stove. The breakfast room is now a sitting area. Traditional furnishings are juxtaposed with a sculpture of a bale of hay used as a coffee table. Gordon explains the collage of paintings on the wall in the room. Upstairs are two bedrooms – one for his grandchildren – plus Gordon’s office. The rest of the space has been transformed into his gallery. Because of his extensive connections in Tulsa, he was reluctant to work exclusively with any gallery, so Gordon’s work can be viewed at the residence by appointment.